🎈 Order 2 weeks in advance. 🎈 Leave party date at check out. 🎈 I'll ship 5 days before the party, we don't want the slime sitting for too long and get sticky. 🎈 Please note that even though I try to send the the slime in perfect condition it might arrive a bit sticky since it's still pretty hot in some states. 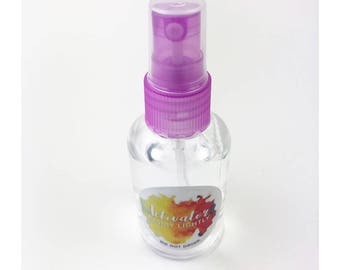 I always include a spray bottle along with your order, so you can quickly and conveniently activate your slime before or at the party. * Unicorn Birthday Cake Slime Size: 4 oz, 6 oz, 8 oz and party packs of 10,20,30,40 and 50 2oz slimes. * Unicorn Birthday Cake Slime: stretchy, full of texture and holdable. * Enjoy hours of Unicorn Birthday Cake Slime stretching, pulling and squishing. 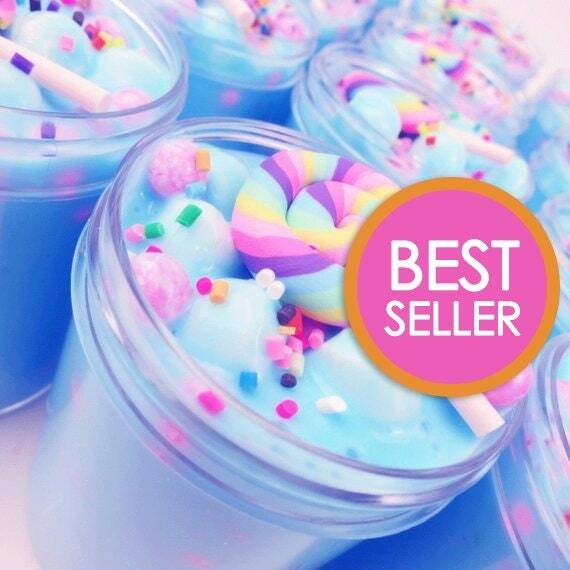 * Unicorn Birthday Cake Slime is a perfect gift idea for a Birthday. * Unicorn Birthday Cake Slime will NOT leave stains on hands, furniture or carpet. * Not recommended for kids under 3 years of age. I purchased this slime and another two from ArtisticSlimez for my daughter. And all I can say it they are amazing!!! My daughter really loved them and the scents. I definitely will be ordering from them again in the future. I sell 4 oz, 6 oz & 8 oz slimes. Each slime container comes with the proper amount of slime filled to the top threads with a little room for possible slime expansion after you play with it. This varies depending on your location. Buyers in the U.S can expect their packages in 2-5 days AFTER shipment, but international shipments could take up to 2-8 weeks. Use the included borax to create a liquid activator and follow the directions to make it less sticky. BE CAREFUL... DO NOT over activate any slime that has beads (floam, fishbowl, etc.) As the beads will fall out. Use very little at a time because I can't be responsible for damaged slime if the you did not follow the instructions I provided. Stir in 1 tsp. of included borax into 1 cup of warm water. Once mixed, apply small amounts to your slime until your desired texture is achieved. Slime is meant to stretch to a certain degree but not meant to be ripped or pulled hard, in those cases it will rip. Clear based slimes tend to rip easier than white based slimes. Temperature has a lot to do with this as well. Play with the slime a bit and as it warms up it should get more stretchy. For CLEAR BASED SLIME - Don't add lotion because it will make it cloudy (and ugly) but instead add a little bit of clear glue and work it in really well. Apply small amounts of moisturizer and/or lotion to your slime and knead it in. Note that applying lotion to any slime made from clear glue will make your slime cloudy. Adding small amounts of water or clear glue can sometimes help soften clear slime. What all do I get with my order of slime? • The awesome slime you ordered! • A beautiful instruction and care card that shows you how to take care of your slime. • A small baggie of borax so you can make your own activator (NOTE: Don't put the powder in the slime... you need to mix it with water to make the activator liquid... then use just a very little bit. Can I have FREE SLIME to review? Send me a request and tell me a little about YOU and share a link to your social media account that you'll use for the review. Of course I do :) Follow me! I sell 4, 6 & 8oz slimes. I fill the containers all the way to to very top. The thing that is important to know is that I overfill the containers - I send you more than you bought. Example: I took the 6oz container and filled it to the rim (where I pack the slime to) and I was able to but almost 8 ounces in the 6oz container. Why do I fill it to the rim?